Working for healthy and just communities for all. We believe rights and democracy are won when people come together to make their voices heard, so we’re building a strong movement and the people power necessary to win justice and improve the policies that affect us and our communities. From making sure that every worker earns a livable wage, to securing access to quality healthcare and education for all, we are active in a broad range of issues that people face every day. It’s evident that low-income and working families are not being represented by our elected officials. People across Vermont and New Hampshire formed Rights & Democracy to build a movement to counter the influence of money in politics and to hold elected officials accountable to upholding our rights and the democracy we live in. Our members are young and old. They are families, single people, retirees. They are working people who come from communities all across the state. 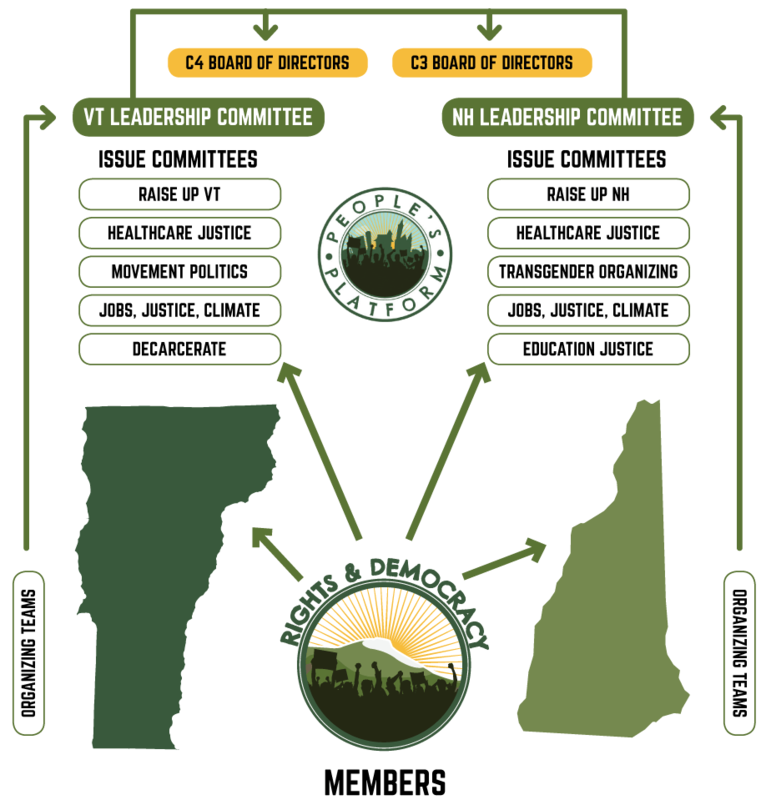 Together, we create change through grassroots organizing, educating and mobilizing around the issues that affect our communities, recruiting and training candidates to run for office, and working through the political and electoral process to advance progressive policies that lead to happy, healthy, and just communities for all Vermonters. Our mission is to bring people together to take action to build healthy communities and make the values of our communities guide the policies of our government. We are building a popular movement to advance rights and build a real democracy. We work in partnership with community groups, progressive unions, faith communities, organizations fighting for human and civil rights, and environmental and climate action groups. We believe we can achieve a society where people earn a livable wage and have access to affordable health care, and where a progressive and equitable tax system supports an economy that protects the environment and human rights. We believe Vermont and New Hampshire can lead our country in a new direction towards happy, healthy, and just communities for everyone. Our nation has failed to establish a democracy that safeguards our fundamental, inalienable rights to achieve full human dignity and to advocate effectively for that dignity. We are united in our fight to build and secure true democracy, a democracy that guarantees the rights of all to a sustainable and secure livelihood. We are united in embracing our shared humanity and to committing ourselves to the struggle to claim our inalienable rights, to build collective power, and to achieve systemic change toward a safe future for humanity and our planet. We are united in our vision of a society committed to human rights and core democratic principles. Our work to bring that society into existence is guided by a commitment to equity, solidarity, universality, justice, accountability and transparency, power, sustainability, safety and freedom. We believe that each person should get what they need, when they need it. We must dismantle the deeply rooted systems that have led to this historic moment of inequality, addressing diverse, intersecting sources of oppression and confronting every inequity that our communities face. We must create a system that allows each person to live their life with dignity. We believe that our rights are interdependent and interconnected. Denial of one right impacts all other rights. We mobilize and build power with people and organizations doing movement work within their own networks and communities. We stand up for each other. We break down silos. We believe that these interconnected rights and principles are universal to all persons. We believe that all injustice is interrelated and a part of a system that exploits each of us, therefore, we must organize across and within multiple systems and kinds of oppression: social, cultural, economic, and environmental. An injustice to one is an injustice to all. Because of racism, sexism, imperialism, economic exploitation, and other forms of oppression, our system exploits some of us more than others, and we must include an understanding of these diverse impacts in all of our work. We believe that our systems of governance must be held accountable to the people who they impact. We must be able to see clearly how any action, decision, or policy impacts each of us. Governance should not happen behind closed doors. We believe that democracy is more than voting. Everyone has a right to, and should, actively participate in decisions that impact them. In a robust democracy, we exercise our power tocreate a society where each can live a life with dignity and fight against the forces that wield power over us to deny us that dignity. We believe that we are all organizers. We are building a sustainable, leader-full movement. Our movement is about people, and creating relationships that support each of us as leaders allows our movement to live beyond each of our lives. We believe that our work, vision, and rights must survive each and all of us. Our actions and systems must have the power to serve and preserve our human rights and a robust democracy for generations to come. In this way, we can preserve dignity for all people and the planet. We believe that we must each, as human beings, be safe in order to live a life of dignity. We believe that every person has a right to safety from any and all kinds of physical, sexual, and emotional violence in their home, workplace, educational institutions, and communities. We support efforts and causes that enhance the safety of our fellow human beings. We believe that we must have the freedom to name and claim our rights and to change any system that does not ensure these rights. We believe that the ultimate purpose of our work is to secure the freedom for each of us to live with full dignity within vibrant, democratic communities.